The New 6 in 1 Twin Support and Feeding Pillow! A MUST HAVE FOR NEW TWIN PARENTS! Great back support for mom and babies! Great for close bonding time with mom and babies! RETURNS: Each Twin Z Pillow is a brand new, single owner baby product. We are therefore unable to accept product returns except to exchange damaged goods. Please contact us for an RA number within 3 business days in this case. As seen on ABC's Show SHARK TANK- The Twin Z Pillow! The New 6 in 1 Twin Support and Feeding Pillow! Breastfeeding! Bottle Feeding! Tummy Time, Support, Infant Reflux, & Toddler Time! Amazing back support for nursing 2 babies at once! A true must have for parents of multiples! If you have any questions about this product by Twin Z PIllow, contact us by completing and submitting the form below. If you are looking for a specif part number, please include it with your message. Twin Z Pillow + 1 Designer Navy Lattice + FREE Travel Bag! 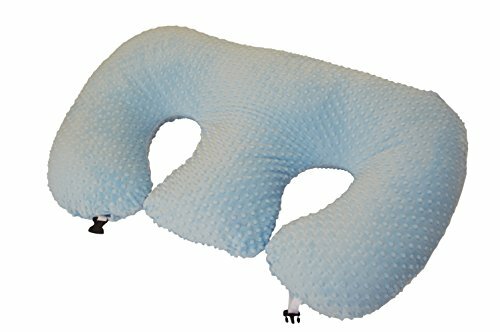 Twin Z Pillow + 1 Teal Cover + Free Travel Bag!